Product prices and availability are accurate as of 2019-04-23 13:18:22 UTC and are subject to change. Any price and availability information displayed on http://www.amazon.com/ at the time of purchase will apply to the purchase of this product. THE ARCTIC WOLF: Also known as the Arctic wolf, the white wolf is a subspecies of gray wolf native to Canada and Greenland. Relatively small compared to other wolf species, the white wolf's size doesn't match its outgoing nature, as they are known for approaching humans without hesitation. 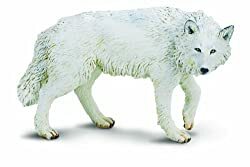 VICTIM OF EXPANSION: Although the white wolf is not considered vulnerable or endangered, it is experiencing a gradual loss of its endemic habitat due to human expansion. Because of this, their population in the Greenland range isn't nearly as stable as their population in the Canadian Arctic Archipelago region. 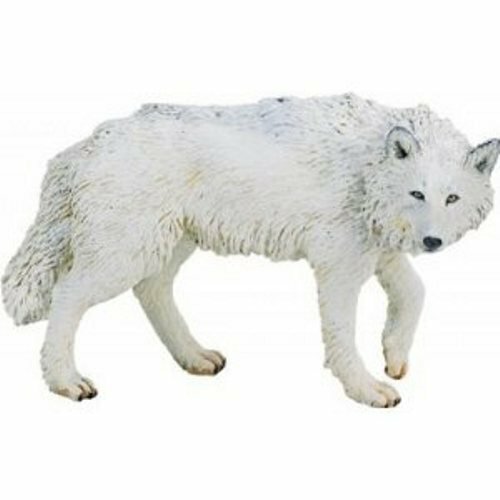 MADE WITH INDUSTRY-LEADING STANDARDS: All Safari Ltd. figurines have been individually hand painted with careful detail. They feature quality construction from BPA, phthalate, and lead-free materials to ensure your family's safety. PUMP UP YOUR PARTY: There's a Safari figurine for everyone in every size. They make excellent craft projects like card holders and ornaments. For parties, you can use them for favors, cake toppers, or decorations. Plus, their realistic design makes them an accurate representation for dioramas and school projects. Let your imagination and creative side run wild with Safari Ltd. PRODUCT SPECIFICATIONS: 3.6 inches long and 2.2 inches tall, this figurine is about the size of a deck of cards stood on its side. As its name implies, the white wolf's coat is almost entirely pearlescent white, allowing it to blend into its surroundings when it's on the prowl for prey.